After cancellations at Aston and Tweseldown, Gatcombe was supposed to be our first BIG event of 2016; an opportunity to bring out some of the more advanced horses to stretch their legs and get them back into the swing of things. Good Friday was beautiful – blue sky, sunshine, and we started well in the Novice, with two double clears producing a 6th and 14th place. 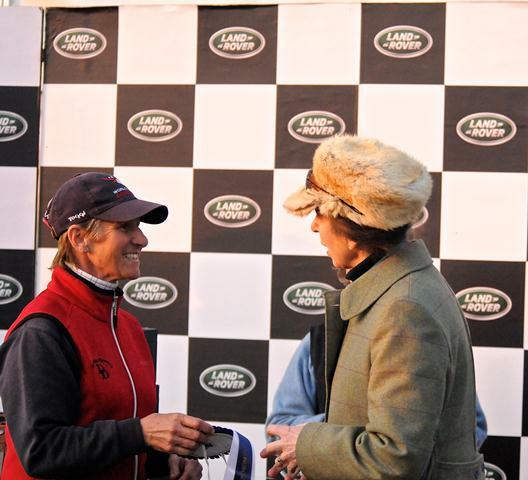 The picture shows Maggie receiving the 6th place rosette from HRH The Princess Royal on behalf of David and Cracker Jack II. Saturday dawned in drizzle, and stayed that way until mid afternoon when the heavens opened and an already soggy ground became a quagmire in minutes. Sadly our in-the-running dressage scores in the Intermediate Novice were drowned by the rain.